I am pleased to confirm that we have had a much more successful few months than at my last update. The main focus of work by the weekend gang has been at Haworth Top (Loop South Turnout) and between Ingrow and Damems. The Thursday gang have been their usual productive selves quietly carrying on with minimal fuss on a wide variety of jobs. During April, both the weekend and the Thursday gangs focussed their attention at Haworth Top points. The turnout has been out of action for around 18 months after it was partially renewed during Civil Week 2014. Since the turnout did not see much use it was left then in an incomplete state as other priorities came forward to be worked on. 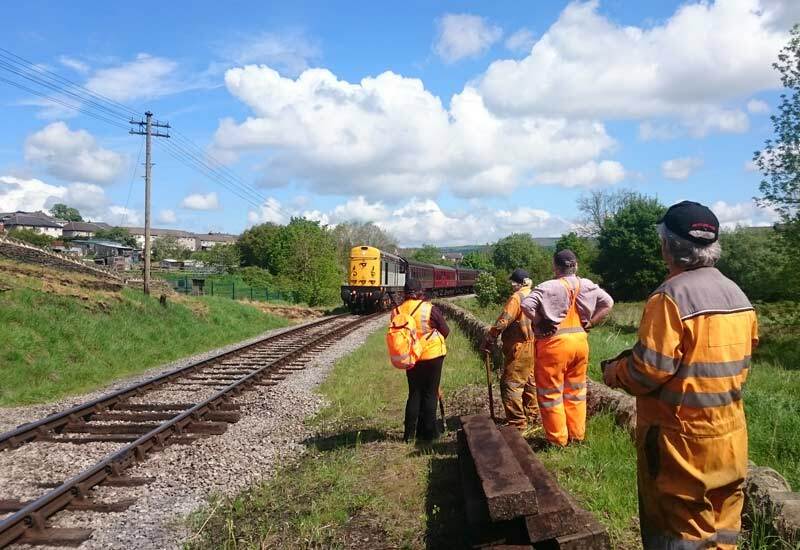 With the visit of a main line tamper from Volker Rail agreed for the end of April, it gave us the kick we needed to have the track element of the renewal completed. Over a series of working days the sleepers were drilled, rail chairs installed and the rail fitted. Then, by gauging the track, the opposite rail was installed in the process. Once everything was connected up with the traps and the new plain line in the loop, the track was aligned and packed with ballast to maintain the formation. Three sentences to describe a month’s work! Turnouts (also referred to as Switches and Crossings (S&C)) are some of the most technical bits of equipment dealt with in the department, during installation there is less room for error than on plain line. S&C is considered the biggest derailment risk from the track. The tamper visit was successful and the follow up Kangoing (see Winter update for description of Kangoing) has been completed. Now we await the S&T connection which is currently coming to the end of its design for installation over the summer months. Fingers crossed the loop will be fully operational by the end of September. The rest of the spring has been focussed on ‘spot re-sleepering’ between Ingrow Tunnel and Damems. Spot re-sleepering consists of removing sleepers as required for renewal, but not removing a significant amount. This allows trains to continue running and the rails to stay in place, meaning work can take place at weekends while trains are running. This section of track has deteriorated recently, despite receiving attention from tampers. 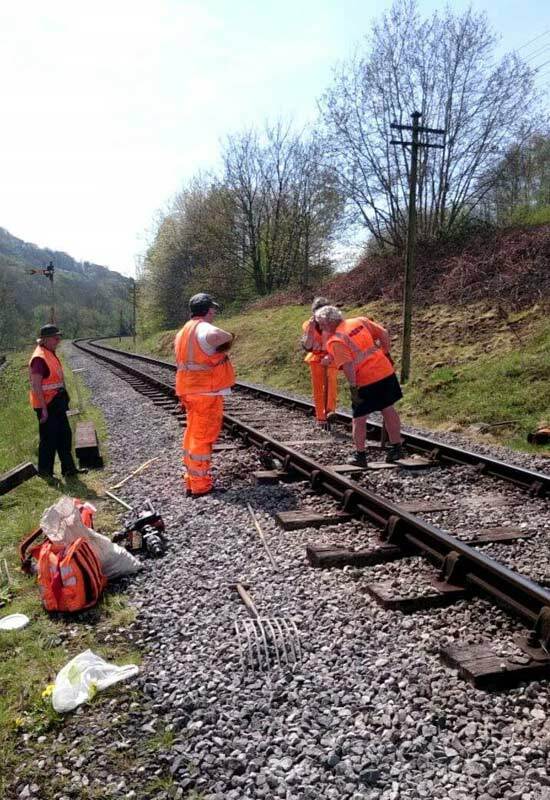 Given the poor condition the track was monitored and it was discovered that the gauge was widening due to the chairs shuffling outwards in the sleepers. Therefore, the decision was taken for a series of sleeper renewals. The sleepers were dropped off by our works train using the Atlas Wagon, our very useful flatbed wagon with a Hi-Ab arm attached. The sleepers could then be distributed along the section to allow for progressive renewal each working weekend. Unfortunately, it is a task that generally requires a large gang which is not always easy to come by. Sometimes we do not have big enough gangs to undertake major works like re-sleepering and need more simple jobs. This can also be the case if we have no one experienced to take charge of the work. Where either of these have been the case, we have been cutting down saplings on GN straight. Major devegetation works were undertaken there several years ago and, now that the trees are making a comeback, we are trying to get on top of the situation. Once they grow past sapling stage we cannot cut them down ourselves, although disposing of them is somewhat more problematic. The Environment Agency now requires exemptions for burning vegetation waste on property, applying for the exemptions takes time as a new one is needed for each site. A perfect example of the work that is required behind the scenes, ensuring the paperwork is in order, to ensure that we can do our jobs out on the track. The Thursday gang, as always, has been very productive. Two of their main jobs have been vegetation clearance and wall repairs. Vegetation clearance focussed mainly around the Ebor Lane area below Haworth Station. Vegetation clearance is one of those jobs that is so easy to forget about and before you know it, it is a huge job to get back on top. We are certainly not immune to the adhesion problems suffered on the national network each winter. 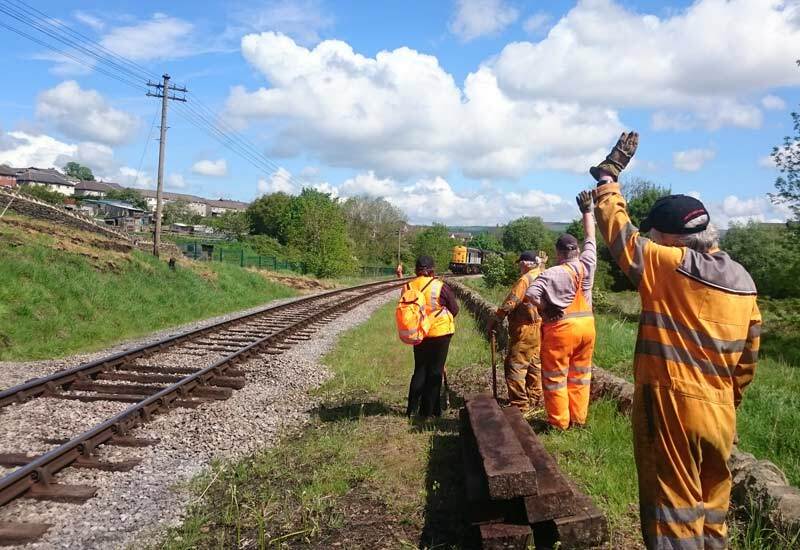 Keeping the railway’s boundary intact is a similar never ending task for which, as we try to maintain the character of a ‘bygone era’, dry stone walls are certainly preferable. The disadvantage of this is that they are easily knocked over by people, livestock and the weather. Thankfully, the Thursday gang now have a lot of the skills required to keep repairing the walls, with great help from a few specialists of course. Other jobs have included tamper preparations, welding joints and clearing up scrap. The variety of work the Thursday gang get up to never ceases to amaze me! Hope you all have a good summer, if you have the time feel free to come and join us! As you can see we make use of a very wide variety of skills and always need an extra set of hands whatever your skills. Civil Week is fast approaching and I will be back with an update on our plans in due course.